Low-fat protein and veggies are essential fitness foods. This easy to make dish is filling and nutritious. Cook extra helpings and enjoy with your favorite whole grain and you’ve got a few days’ worth of ready-made fitness meals. Tear off four 18-inch sheets of aluminum foil. Place a chicken breast in the center of each. Divide the mushrooms and zucchini between the four and pile on top of the chicken. Drizzle 1/4 cup Italian dressing over each. Seal the packets by bringing up the sides of the foil sheets and folding over the top edge. Seal the ends, leaving enough air to circulate. Place packets on a cookie sheet. 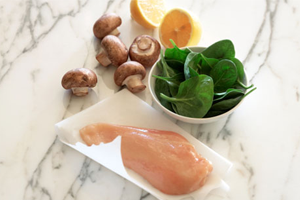 Cook for 20 minutes, until chicken is cooked to an internal temperature of 165 degrees.